I looked through some old photos and found this one. I know I wanted to put it up here and I can’t remember if I did it already or not, so here it is and if you recognise it, too bad. 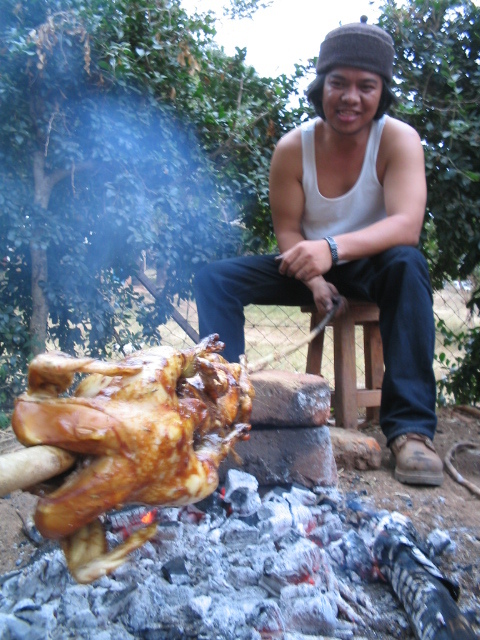 This is Josh roasting Kuku at a VSO party last year. I just love the photo: the blue smoke and orange coals, the man himself so hot he had to strip to his vest (singlet or whatever the hell americans call them: tanktops or something) but not so hot that he could remove his winter hat! This entry was posted on Friday, March 18th, 2005 at 8:38 am	and is filed under Uncategorised. You can follow any responses to this entry through the RSS 2.0 feed. You can leave a response, or trackback from your own site. mmmm…. me very hungry now …..
We Amuuuricans typically call those tank tops, but that particular style is often referred to as a "wifebeater," due to the trailer trash types that usually sport them. I’m not making this up. I think I remember someone (probably you!) describing the dashing garment that Bruce Willis wore in Die Hard as a Wifebeater. hahahaaaa. I miss josh. Imagine me seeing his picture loging into your blog. We miss you Will, how’s it goig’ on the research front?